Lecture and workshop postponed until later in the year. Jilli Blackwood- 2 day workshop & lecture will take place later this year. Born in Scotland, Jilli Blackwood studied at ‘The Glasgow School of Art’ 1982-86. She specialised in embroidery and weave, graduating with a First Class BA Honours in Art and Design. Her fine art wall hangings can be found in many public, corporate, museum and private collections world wide. The diversity of textiles has enabled Blackwood to work on different projects. “Millennium Kilt No.5” has recently been installed as part of the permanent art collection at the Fairmont Hotel, St Andrews. Her design projects include: The uniforms for the Scottish Team for the Opening Ceremony of the 2014 Commonwealth Games, Glasgow. The space at the Athlete’s Village for the World Anti Doping Agency (WADA) which included the interior, the uniforms and WADA gifts. Heathrow Airport commissioned a tartan for a promotional event in 2015 which was used throughout the airport. These are expressive works and are a reflection of Blackwood’s personality and the vitality she has for this life. 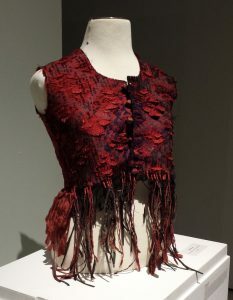 She creates from the heart, knowing intuitively when her imagination is correct, constantly working on the relationship between herself and the textile. Blackwood continues to exhibit. She is an inspirational speaker, and wishes to pass on her enthusiasm to others.